In the last year the changes within the internet marketing space (SEO, SEM, Social Media and PR) have forced the Marketing Agencies, Consultants, Startups and Corporate Marketing areas to drive focus to their Inbound Marketing. In this post we will guide you for the initial steps any Marketing area, startup or even consolidated corporate Marketing Agency should follow for the creation of a Content Marketing Plan. Inbound Marketing is the combined effort of promotion (of a company, brand, product, service, etc.) through different internet channels (ebooks, blogs, podcasts, videos, newsletters, SEO, social media marketing and other channels of content) which help to attract customers. The focus of inbound marketing is bringing customers IN the website instead of the marketer go to “search” for possible customers. Inbound Marketing mantra is to “earn the customer” instead of “buying” the customer. How to Start with Inbound Marketing? In order to be successful at Inbound Marketing, companies need to invest in content, which if the pushing force for Inbound Marketing campaigns. The amount of content generated by companies is increasing dramatically, and consumer are receiving thousands of marketing messages in all of their internet channels. Said this, it is extremely important to plan the content marketing efforts in order to effectively reach the right audiences, add value to them and receive in exchange, their loyalty and their business. Tied with the effectiveness, the ability to measure it is necessary in order to gather data, calculate the Return of Investment (ROI) and be able to iterate the process with more information that will help to improve the content and its reach. Content planning is one of the key success factors for an effective and efficient Inbound Marketing Campaign. We will describe a simple four steps process combining general knowledge business and marketing tools that will help you trace the path of your content strategy. The management tools described apply to every planning activity and the value is not only driven through the final work product, but for the process itself. SlideModel provides a set of Professional PowerPoint Templates where the users can edit the placeholders and iterate over the management tools through the analysis process. Analysis of your current and past marketing efforts through the use of the SWOT tool. 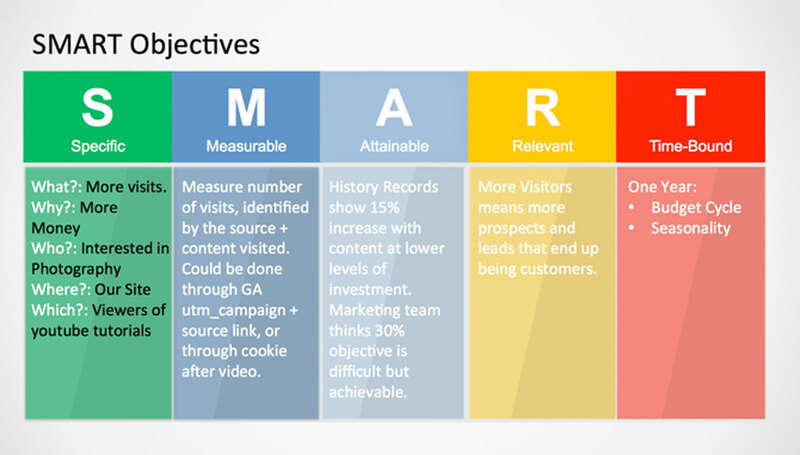 Definition of clear objectives and how to measure them in order to build SMART KPI’s. Brainstorm ideas for content, matching it to the stages in the buying life cycle (FUNNEL). Create a Plan (Tasks, Resources, Duration) with a PowerPoint Timeline. SWOT is a popular analysis and decision-making management tool. The word is the acronym for Strengths, Weaknesses, Opportunities and Threats. 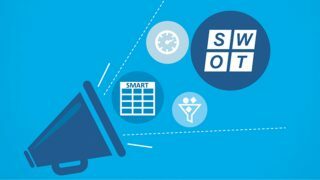 SWOT analysis is helpful for understanding a current situation and be able to create a positive strategy. The tool framework is very simple, it consists of a 2×2 matrix (4 quadrants), where each cell represents one of the components of the SWOT acronym. This matrix should be analyzed jointly, in order to picture at the same time the major components and visualize the relationships. If you want a deeper understanding of the SWOT Analysis and a practical guide to create it with professional SWOT PowerPoint Templates you can review our previous post “Best SWOT Analysis Templates for PowerPoint“. The Content Analysis starts with a simple exercise; present the 5 major strategic strengths and weaknesses of your current content marketing efforts. It could be difficult at the first try, but the iterative approach, trying to reach the five points, is vital to analyze your knowledge about the marketplace and environmental situation. In essence, you need to set a title for what is working well, and what is not working. This deep thinking will trigger in the analyst or group of analysts, several leverages that will allow fresh ideas in future steps of the process. Our Customers are used to work with remote teams, and having a PowerPoint Templates as the canvas for working through shared environments is ideal. You can use some tips of online broadcasting from our previous blog “How To Broadcast PowerPoint Presentations Through the Web“. Using “virtual” sticky notes in the PowerPoint Slide makes it easy to keep the previous ideas and track the evolution of the SWOT analysis. Also, printing the template in a poster and generate an Agile meeting , working with tangible paper, also triggers interactions and creativity; take the suggestion and try it, it has proven track. Lets describe an example. Consider the “Stock Photo Business” where a company sells pictures to their users. 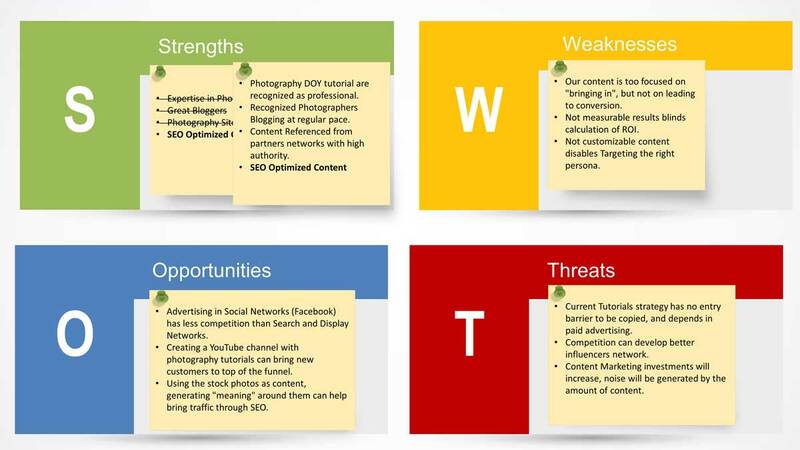 The content marketing SWOT could look like this, after a couple of iterations. Look at the ideas and their evolution. The team starts to realize the effect of their content strategy. The PowerPoint Template shows in one snapshot the full team ideation, and will be extremely easy to showcase later. Expertise in photography -> Photography DOY tutorial are recognized as professional. Great Bloggers -> Recognized Photographers Blogging at regular pace. Photography sites linked -> Content Referenced from partners networks with high authority. SEO Optimized Content drives traffic. Our content is too focused on “bringing in”, but not on leading to conversion. Not measurable results blinds calculation of ROI. Not customizable content disables Targeting the right persona. The second steps moves to the Opportunities and Threats. At this point the analysis has traversed the initial iteration that breaks the ice of ideas. Now, strategic thinking flows, and opportunities are clearer, and potential threats to them are not any more hidden. Advertising in Social Networks (Facebook) has less competition than Search and Display Networks. Creating a Youtube channel with photography tutorials can bring new customers to top of the funnel. Using the stock photos as content, generating “meaning” around them can help bring traffic through SEO. Current Tutorials strategy has no entry barrier to be copied, and depends in paid advertising. Competition can develop better influencers network. Content Marketing investments will increase, noise will be generated by the amount of content. Once the SWOT analysis has concluded, is time to summarize the exercise and create an actionable plan that takes advantage of it. Empowered by the strengths take action over the opportunities, and knowing your weaknesses protect your Content Marketing efforts against the threats. Change the approach of your Photography tutorials moving towards Edition of Photos in order to create conversions. Create a Content ROI system along the funnel, measuring acquisition costs, conversion rates and amount spent in content creation, curation and promotion. 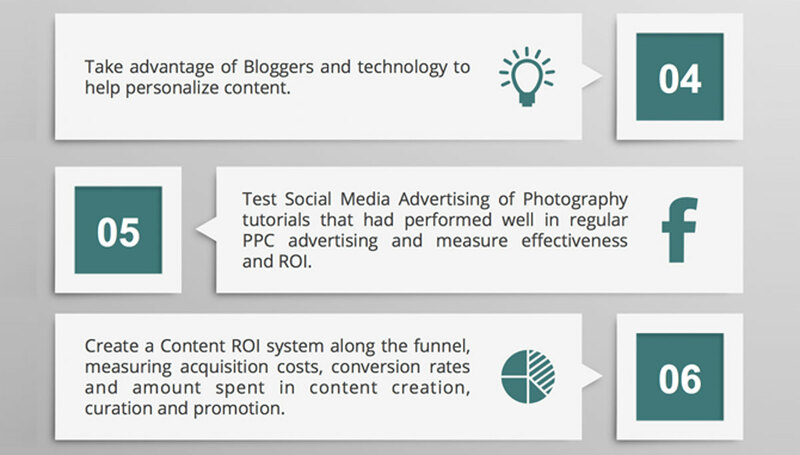 Test Social Media Advertising of Photography tutorials that had performed well in regular PPC advertising and measure effectiveness and ROI. Create a Youtube Channel of free photography tutorials powered by the partners network. 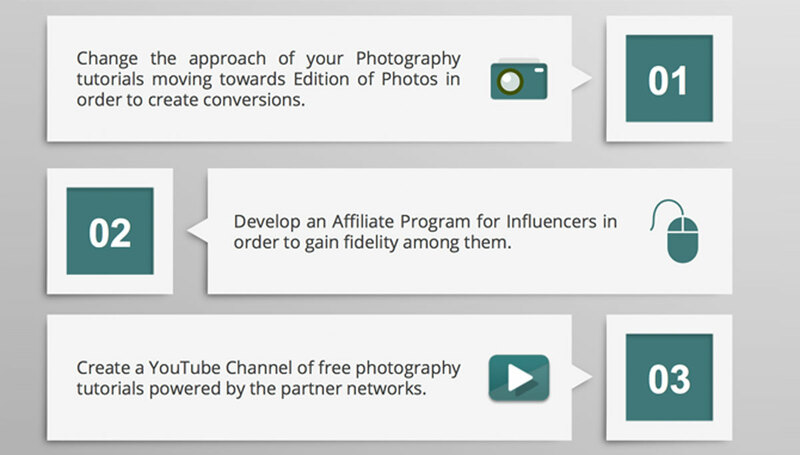 Develop an Affiliate program for Influencers in order to gain fidelity among them. Take advantage of Bloggers and technology to help personalize content. You can use one of our Text & Tables PowerPoint Templates in order to present the plan clearly visually and add it to your deck. Each of the sections describe the Actions that the plan will execute. This template allows clear presentation of the ideas, catalogue them including an Id number and visually engage the audience with top of the line PowerPoint Icons. After the analysis stage, the next step consists of defining the objectives that maps to the actions described previously. For each objective it will be defined a key performance indicator (KPI) that will measure the progress toward achieving the objective. This methodology is the basic foundation of the strategic approach to Content Marketing and will provide visibility in order to understand if the content marketing plan is on track or not. Reach: Awareness, drive visits and presence. Act: Engage Audience with brand. Interaction and Visits. 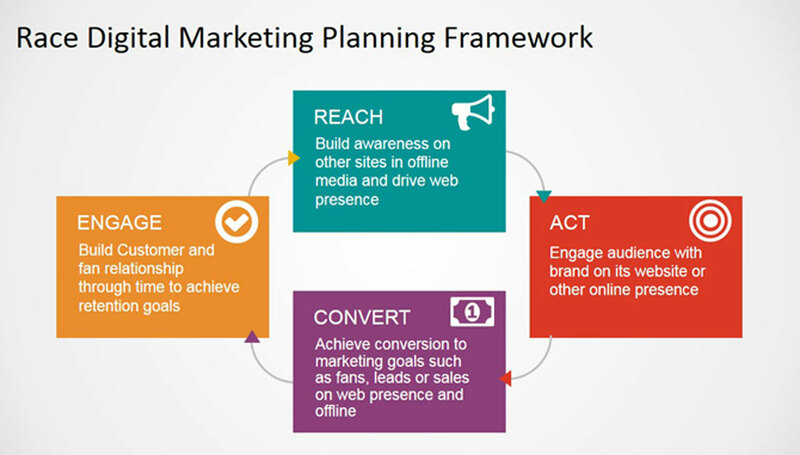 Convert: Achievement of marketing goals. In each RACE Stage its necessary to define the objectives and KPI’s. For this purpose we will use the second management tool, the SMART Objectives Goals setting framework. Measurable: If You Can’t Measure It, You Can’t Manage It. Goals need to be quantifiable. Progress towards achievement must be measurable. Attainable: Goals need to be possible, in a realistic scenario. Relevant: Goals need to matter. Managers can choose infinite goals, but only a few will matter. Time-bound: Goal need to be achievable in a time frame, that could be planned. How To Work With the RACE and SMART PowerPoint Templates? Action will match a specific stage: Great, this is the best scenario. Action will match no stage: Great too, this means, the action is not really “actionable” for your content marketing plan. Return the idea to the previous stage for more “idation” iterations. Once your actions are placed along the customer lifecycle, start defining the objectives you want to reach. For this purpose we will apply the SMART criteria on the first objective as an example. Lets consider the action of the creation of the YouTube channel. This action is a driver for Organic Traffic. What is what we want to achieve? We apply the SMART Objectives criteria to this action in the following Slide Template. After all our plan actions have a goal, and each goal has been analyzed through the SMART criteria, we complete a snapshot of all the analysis conclusions in a RACE Matrix, where each row represents a stage of the funnel and goals, KPI’s and actions are recorded for follow up. Once the content SWOT analysis is concluded and an actionable plan is in place across the customer lifecycle, its important to identify the GAP’s between the content assets you organization creates, and the content your audience may consume. At this point you have measurable objectives to achieve. It is time to look into the content spectre your audience consumes, and identify if you need to adjust your content generation strategy to fill the GAP. In this stage, it is also important to look to the competition and understand their content strategies. 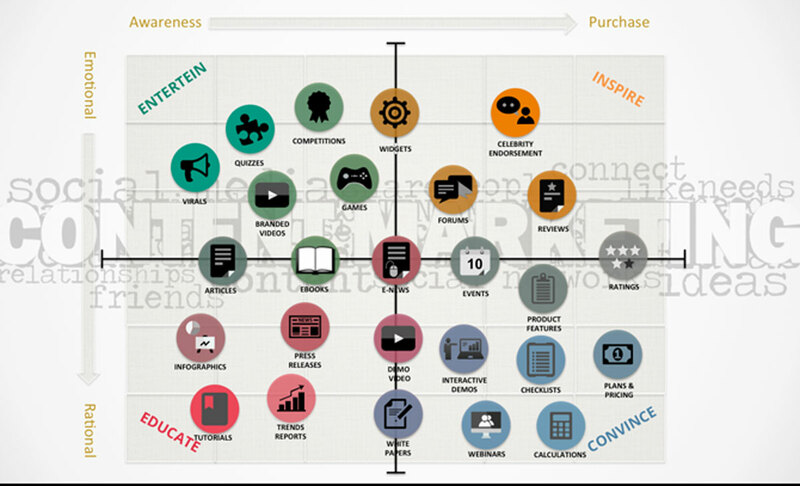 For this purpose we propose the use of the Content Marketing Matrix and the Content Marketing Media Matrix. These tools are simple four (4) quadrant matrixes that used together can provide insightful information of Content Assets GAP’s. How to Use the Content Marketing Matrix? The Content Marketing Matrix is a simple tool which aims to generate “quality conversations” between the content creation teams and marketing stakeholders. Information about assets can be organized in a visual perspective that provides insights about their possible effect over the audience and the business. From left to right the horizontal axis represents the buying funnel, from awareness to purchase. From top to bottom, the Vertical axis represents the emotional effect that the content tries to generate in the audience, ranging from emotional to rational. The tool places the different content assets across the matrix, analyzing which is the content objective to the marketing organization and the emotion that reflects. During this analysis the marketers may identify GAPS within the chain of content that should guide the prospect from Awareness into Purchase, swinging within emotions and rationale. Educate: Create Rational content that will attract the audience through the initial stages of the funnel. The objective is to educate the audience about the subject matter expertise of the product and business industry. Ideal for Tutorials, Trends Reports, Press Releases and Infographics. This quadrant reflects the organization knowledge and the willingness of sharing it with their digital community. Entertain: Create Emotional content to attract the audience through empathy into the initial stages of the funnel. The audience will invest time in this content assets to satisfy their entertainment needs. This assets include viral content over social networks, quizzes within the user base, competitions between the users for an award, branded videos over Youtube or online games. Inspire: Create Emotional content to help the purchasing decision to guide the user from customer to advocate. The content assets are generated through interaction with customers. In this quadrant locate the content assets related to product reviews, grant access to your users forum to share the content with the new audience, or find influencers to talk/write about your product/service and generate sharable content with their mentions and endorsements. Convince: Create Rational content to complete the purchasing decision. The assets located in this quadrant should help the prospect to choose your product/service. Content under this characterizations are product features , checklists, your users ratings , interactive demos or webcasts. Finally the obligatory content is the Plans and Pricing sheet. To start using the matrix you can download SlideModel’s Content Marketing Matrix PowerPoint Template, a 100% editable version of the Content Marketing Matrix, with professional quality Icons that makes easy the copy and paste of assets into the Matrix Map, in a “post it” fashion. The process is simple and intuitive, the user selects the content assets icon and drags and drops it over the empty matrix canvas. Iteratively, the users and audience starts to relocate the assets over the quadrant covering the funnel. Immediately after the first iteration the stakeholders will identify the GAPs, and will plan for the missing content. 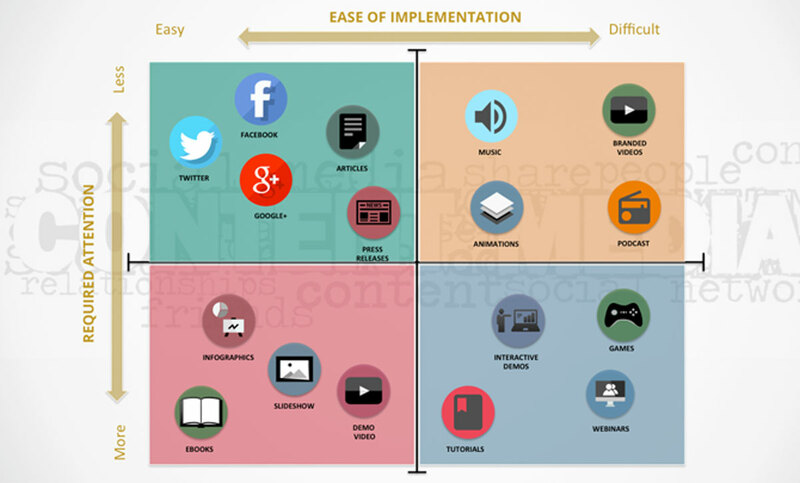 How to Use the Content Marketing Media Matrix? The content Marketing Media Matrix is an intuitive tool that helps understand the relative effort of creation of media asset compared to the relative attention they will generate over the audience. Once the Assets GAP was identified during with the Content Marketing Matrix, the team can work with the Media Matrix and prioritize the efforts. As the previous tool, this is relative comparisons that provides guides for insights analysis between involved stakeholders. The process is simple, just drag and drop the assets over the matrix canvas and position their location in the quadrants according to the effort and attention dimensions. Visually the team will clearly identify which content are a priority and which will not be as effective. Going back to our example, we had put both matrixes into practice to show the final result of the analysis. The business assets of the example organization are focused on the photography and web design industries, the content to guide the user through the funnel tries to generate a simple rational path. No big branding efforts. The example clearly identified a GAP in the Entertain Quadrant, that was analysed later in the media matrix to define which content assets was going to be created to fill that GAP. The team decided to fill the GAP with Virals through social networks, as being the most effortless content that could be generated reusing existing assets. Even though will not be the most engaging, the GAP will be covered and measurable results will show the effect. After the analysis steps have been completed, the content plan is in place, and the assets required are agreed, is time to create a realistic timeline. 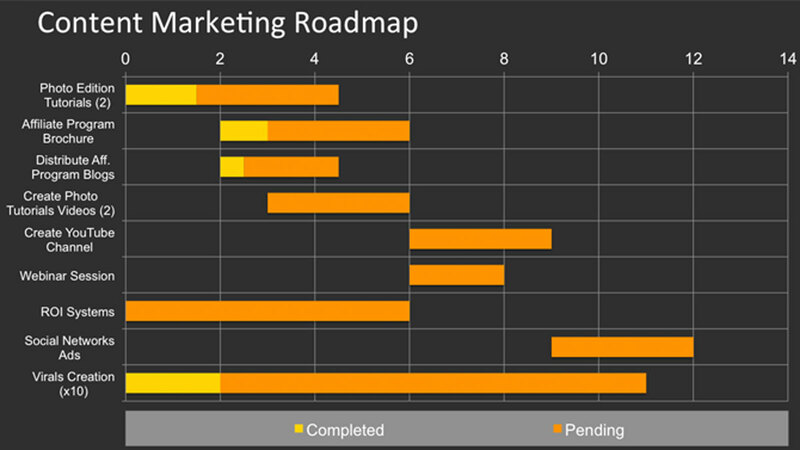 To create the Roadmap we suggest the use of a Gantt Chart Template. This template is suitable to represent tasks, resources and time in a visual way, and extremely easy to edit through its data driven nature (you can edit it though Excel). The timeline will contain the tasks involved in content creation and the tasks related to the publishing of each assets in the different digital marketing channels. You can create one slide per task if you need to sub subdivide the tasks and give a more detailed plan. In this post we reviewed a simple analysis process to create a Content Marketing Plan. As a visual tool, several PowerPoint templates served as canvas for the analysis sessions and for tracing the analysis stages outcomes. Also, after the process was complete, all stages were easily presentable just regrouping the slides we edited on each stage. Study your current Strengths, Weaknesses, Opportunities and Threats (SWOT). Design an actionable set of tasks that tackle the opportunities, leveraging the strengths. Design an actionable set of tasks that protects you from the Threats and Mitigates your Weaknesses. Align the actionable tasks according to the customers life cycle (RACE). 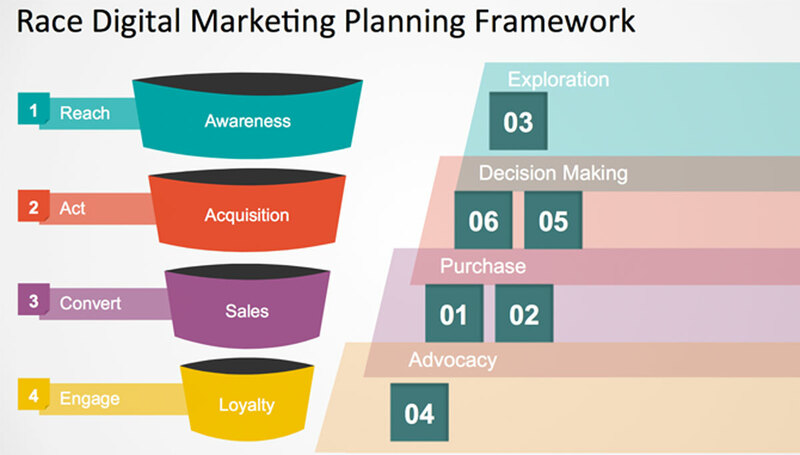 Define SMART Objectives for the tasks across the funnel. 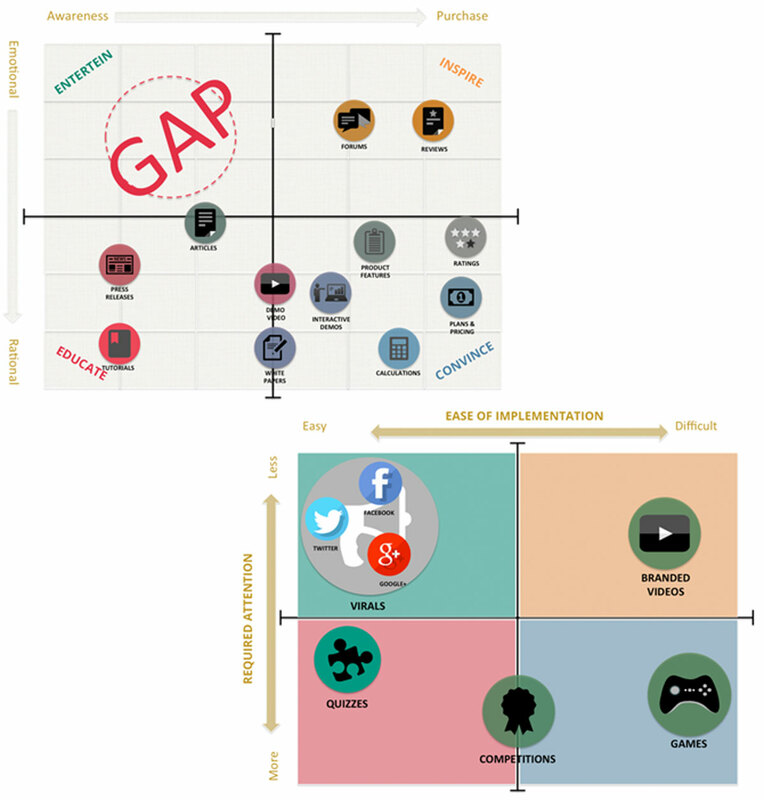 Identify the Content Assets GAPS with the Content Marketing Matrix. 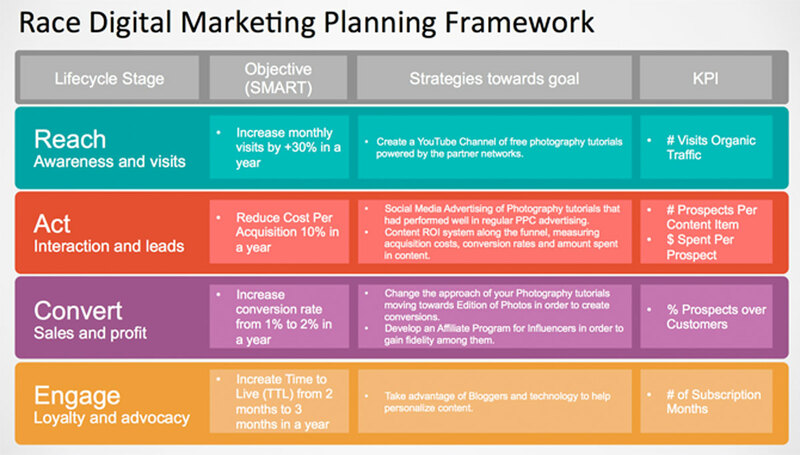 Prioritize the Content Assets with the Content Marketing Media Matrix. Create a Timeline for your Content Marketing Plan defining Resources and Durations.